Earlier this year I was sent a book to review: Dare you? 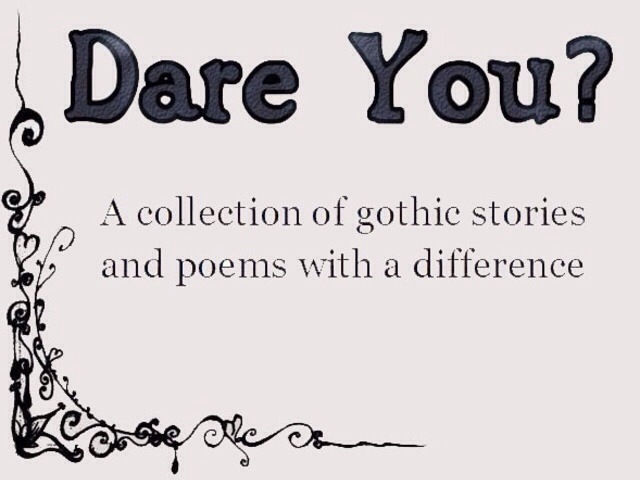 The Gothic Anthology by Gifted Young Writers. The books represents an innovative project by Young Publishers, a group of teenagers (and their English teacher) who are keen to make sure that the original writings of children and teenagers can be read in the real world – as their project outline says, they don’t want their work consigned to the fridge door or the classroom wall; they want it in book shops so their talents can be shared as well as their confidence boosted. Dare You? is their first venture, and focuses on Gothic, perhaps because it is such a popular genre at the moment, at least in its modern forms. This anthology takes Gothic in its broadest possible sense, from graveyards to vampires, werewolves to sci-fi, and even some classical influences; and the inspirations behind the writing ranges from Browning to Twilight. The writers are 12 and 13, and have produced between them an intriguing range of responses to Gothic, from classic moonlit scenes to futuristic apocalypses. Gothic is a complex genre when one tries to analyse and deconstruct it; form, style, aesthetics, purpose and audience are all slippery concepts which vary wildly in the genre without changing an essential Gothicness which is both undefinable and indestructible. All of this and more is apparent here, but there are some interesting complexities about audience here (for whom is this written? What is it’s purpose?) and, as an excellent review of the book from the University of Stirling suggests, the fact that Gothic, traditionally both unsuitable for and appealing to children, is written by children adds an interesting layer, proving its enduring appeal to the young. A particularly appealing aspect of the anthology is the way in which it reflects one of the essential qualities of Gothic: it’s fragmented nature. Fragments – letters, scraps of manuscripts, overheard conversations, lines of poetry etc – have always been crucial to the Gothic genre from Walpole’s fragmented Gothic knight in Otranto onwards. Gothic isn’t coherent, it isn’t a monolithic structure which can be easily defined, and this book reflects that. Poems are interspersed with stories, some of which are tangentially-related fragments written by more than one person, and these work very well as a modern take on Gothic which plays with genre and text. Some of the stories are particularly gripping with a narrative force which is a credit to their young authors. My only small concern about the anthology is the editorial decision not to proof-read and remove small errors of spelling and punctuation. While I quite appreciate that the authentic voice of the writers should be preserved, and that a close copy-edit is out of the question, a basic proofing of errors would be appreciated by this reader, at least, since the mistakes tend to obtrude on the reading process and prove to be a distraction. This matter notwithstanding, the book is a laudable effort which demonstrates the ways in which Gothic as a form changes with the times, is adapted and reframed by new writers, and speaks to generation after generation.